There is a local Thai restaurant nearby that let's you pick the number of stars with each meal, one to five. But experienced guests know they can ask for as many stars as they want. I don't know what the authentic level is, but maybe ten stars, and I've tried three stars and shed a few tears. This book is like a New Englander walking into a Thai restaurant for the first time and picking five stars. This book shocks your senses and makes you weep. It's hard to prepare for the intensity of Dale Racinella's life, his commitment to Jesus, his practical love for the outcasts of our society, and his compelling writing. I read this in one day. I didn't want it to end, but I was exhausted. The complete title explains things pretty well, Now I Walk on Death Row, A Wall Street Finance Lawyer stumbles into the Arms of a Loving God. However, he is not on death row for committing a crime, but to be a volunteer minister to those condemned rightly or wrongly but inevitably to Florida's death chamber. A highly successful Wall Street career demanded all of his time and his family fell apart. He fell asleep at the wheel after a late night deal and crashed his car severely injuring himself. His world was a facade of success. His brother brought him back to church and the vitality of that Catholic church intrigued him. Then an attractive woman in a singles Bible study kept him coming back. God changed his life. Then he started reading the Bible and he let the words of Jesus change his life as well. He wanted to serve with his presence more than with his money. He needed time. They started downsizing. So many cool things happened. They sell everything and move to Rome and learn how the church can minister better than any government social services. We find them, a huge Catholic community of laypeople, many of whom have spouses and children, who are using a third of a half of their time to relieve suffering at their own cost and without compensation. The group, known as Sant'Egidio, provides more services to the impoverished in Rome than the local and national governments combined. They do not share common housing and do not work within the community to support themselves. They do share personal finacnes; everyone must be self-supporting. The members share ministry and daily prayer every night in the churches throughout Rome. Since the 1960s, they have been growing in numbers and in geographic scope with the spiritual and practical focus of relieving human suffering because Jesus told us to do so. pp. 215-216. This is solid spiritual food but dangerously hot. He concludes with his awful experiences ministering on death row in Florida. He's seen executions gone awry. He's seen innocent men, with the liberating evidence ignored by the court, sent to their deaths. Even when the guilty ones die, he's seen the victim's relatives leave empty and unfulfilled, even in anguish. He contends that the death penalty is a large government hand out to the lawyers and is for all intents and purposes an industry unto itself which costs the state more money than life in prison. It also costs the state a hardened conscience. I can agree with him that the death penalty is wicked and does no good. 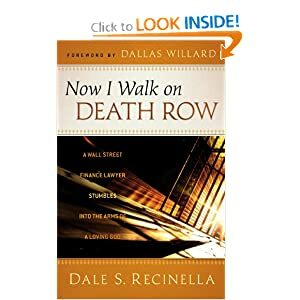 There is so much more to Recinella's life story in this book. He writes as a Catholic stripped down to the essentials of Christianity, something that any Protestant can feel comfortable reading if concerned about strange-to-your-ears prayers and rituals. This story is hot enough to make you uncomfortable by recounting a life radically committed to Jesus. I hope Recinella's story changes me, and I hope it changes all his readers to pursue the kingdom of God first in our lives. I'm thankful to Bethany House for this free review copy.